This church was officially formed in 1801 and in 1805 they rented the former Wesleyan Methodist Chapel in Hills Lane and bought it in 1821. In 1826 it was described as "inadequate" so it was demolished and a new one built on the same site. This chapel was substantially rebuilt in 1870 at a cost of £882. Tenders were invited in October 1869 by the architect Richard Owens of Liverpool. This is the chapel in the rought sketch. The building was demolished in 1931-2 as part of the clearance of the area. 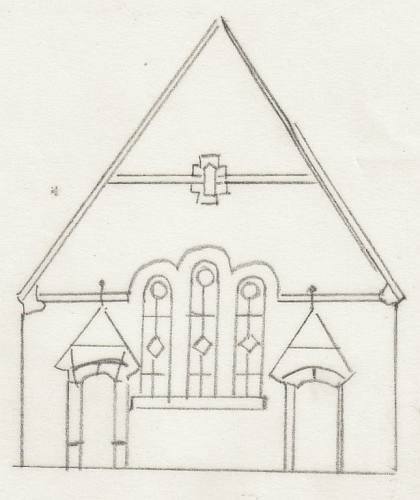 The members then transferred their membership to St. David's Presbyterian Church of Wales, Belmont, q.v.